BI is introducing this new program with wonderful opportunity for professionals to learn from renowned architects and thought-leaders, in the form of intense activities, discussions and workshops. 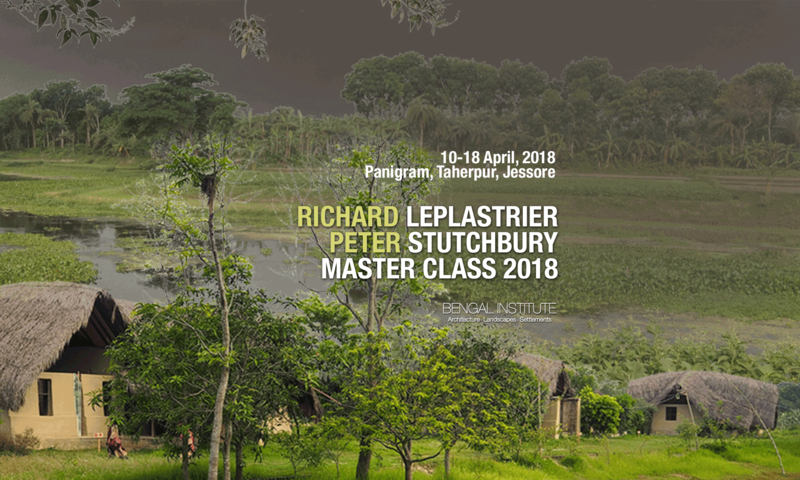 The inaugurating program features the two Australian stalwarts Richard Leplastrier, Peter Stutchbury along with Kazi Khaleed Ashraf, Khondaker Hasibul Kabir and Marina Tabassum, to be hosted at the beautiful site of Panigram in Jessore from 10th to 18th April, 2018. A week in Dhaka: On the first week of April, there will be around three introductory classes at Bengal Institute, Dhaka on week-days 17:00 to 20:00 before the Master-class program begins in Jessore. Marina Tabassum, Hasibul Kabir and Kazi Khaleed Ashraf will give an overview of the program and lectures of theories and works relevant to the upcoming activities. Breakfast meeting to discuss plans for the day. Allocation of groups and assignments around the three villages near Panigram. Working for the whole day, with breaks for lunch and snacks. Evening meeting to reflect on the days works and discuss progress, continues over dinner and other activities. This time the details of the activities will be set later as guided by Leplastrier and Stutchbury and will be communicated with the participants well ahead. Total number of Participants for the Masters Class: 20 maximum. Apply fast, as the seats will run out very quickly. Due to the limitation of on-site accommodation, the number of participants can not be increased. All participants and faculty will stay on-site at the staff-quarter of the under-construction Panigram Resort. Participants will be provided with shared rooms with shared toilet and dining. All facilities and meals are serviced by the locals and a few staff of Panigram project. The staff-quarter is not a resort or hotel (yet! ), it is technically an accommodation facility to support the construction-site. That said, you may not expect neatly done house-keeping every morning! The number of rooms are limited and we can not offer single-rooms for individuals. Everyone must share. Typically it is 3-4 participants per room. You will be provided with basic toiletries, you might want to bring your own. 30,000 BDT for senior undergrad students. The subscription charge includes: Tuition, domestic flights to and from Dhaka-Jessore, all local transportation, shared accommodation and meals. Discount: The amount is already subsidised. We may not be able to provide any discount on it. Installment: You can pay the amount in maximum two installments in if you need. However, the entire amount must be paid ‘before’ the event. We shall arrange for your domestic flight to and from Dhaka and Jessore (if you are coming from any other city of Bangladesh, we may reimburse the cost of your traveling to and from Jessore town). From Jessore Airport to Panigram site, there will be micro-bus vans to share. On-site around the villages we will be riding rickshaw-vans and walking around mostly. If your passport is not eligible for a visa-on-arrival, please apply for a tourist visa at your nearest Bangladesh Embassy at your earliest convenience. Applying and obtaining a visa is your own responsibility. However, we can help you with information and a letter of invitation if required. Most airlines in the Middle-East and Southeast Asia have connecting flights to Dhaka (DAC). You may check kayak.com (or similar sites) for an idea about routes and fare. If you plan well-ahead you may find great deals with stop-over options. Call/text/WhatsApp/FaceTime cellphones: Tauheed +880 18 4405 0599, or Farhat +88 01844 050 707 for any enquiries.